O hóspede deverá pagar 100% do preço total em caso de cancelamento a qualquer momento. O hóspede será cobrado um pré-pagamento de 50% do preço total a qualquer momento. Abraço Carioca-Favela Hostel provides an authentic local experience in Rio de Janeiro, compared to other favelas from Rio, Chapeu Mangueira is the smallest favela in the south zone of the city (most touristic neighbourhood) and has been pacified since 2008 by the government. 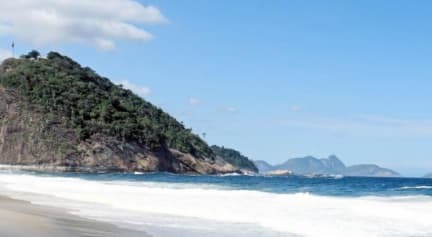 So for the last 9 years it's been a really calm and peaceful place even safer than some of Rio's most touristic areas. Unlike other parts of the city, you'll feel a real sense of community in the favelas, where everyone looks out for their neighbours. 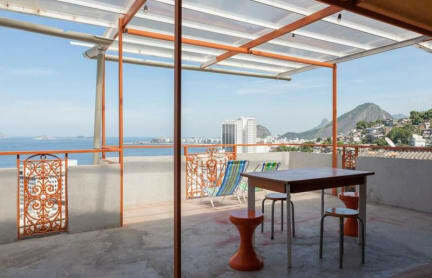 Located in Chapeu Mangueira Favela, it has an incredible view of Copacabana beach.The experience begins with the unique local culture of the favela where we are located: tracks, restaurants, bars, local characters, music and art events. Enjoy an adventure full of stories, sights, smells and tastes of this amazing community. Our rooms are all shared and the best of our accommodation is the views, they are truly spectacular! You can literally see the movement of boats in Copacabana Beach from your bed and terrace. Check in: 10:00 to 18:00 .